Today is my last days of work and we only have 3 more weeks until Baby Wall arrives! Alex and I went to the doc on Monday for our final ultrasound and the baby looks huge. It is not, but considering the last time we saw him/her on the monitor his/her tiny body filled the screen. Now it just the head. Taking up the entire space. I am highly thankful I am having another C-section. 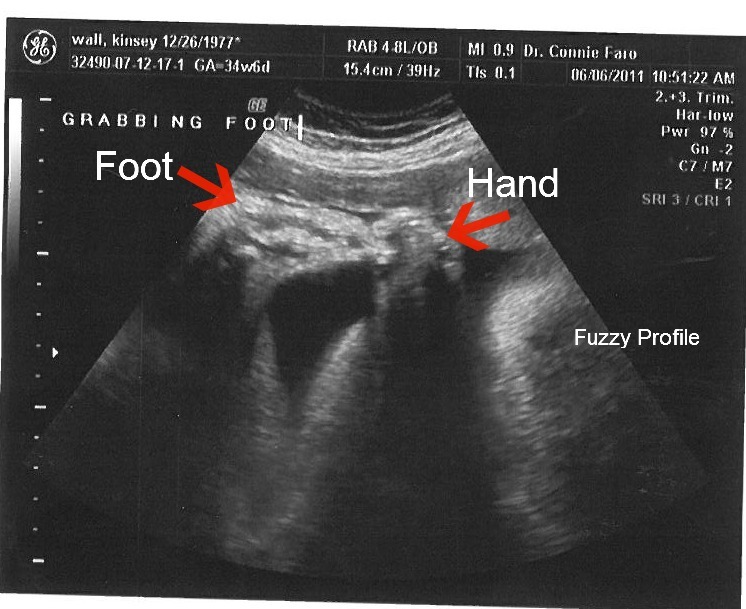 Per the measurements taken by the ultrasound tech, the baby is measuring a good week/two weeks ahead. I can confirm this by my excessive girth. With that info in hand, we decided to schedule the birth for July 7th. And by 'we' I mean Alex and I. Actually really just Alex. He had it all worked out - the 7th is far enough from the 4th to not have to share the holiday but I don't want to be in the hospital over the weekend if at all possible and the 7th is a Thursday so I will be home by Sunday. Me: "Hi Dr. Faro! So I need to go ahead and schedule my C-section and we have a date picked out." Alex: "Kinsey! Isn't the doctor supposed to tell us when we will schedule the due date?" Dr. Faro (as she leans around me to look at Alex): "Usually. But with your wife, no." Back to me she says: "So tell me when you want to have this baby?" 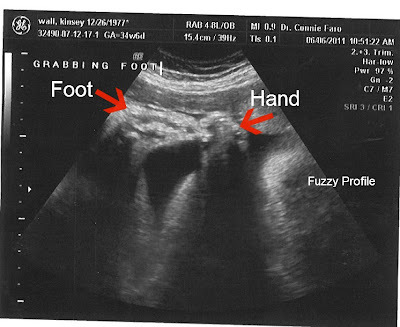 Baby Wall was not cooperating with a profile or 3D picture but we did get this super cute (though fuzzy) image of him/her grabbing its foot. Being the carrier, I do not appreciate this type of movement as this baby moves all.the.time and big movements, like the one below. Reassuring, yes. Comfortable, no.